The global cartoning machines market is a fragmented one that contains a large number of companies of varying sizes. Competition in the market is intense as companies outdo each other with newer offerings employing progressive technologies. Keen players are pouring substantial money into research and development to incorporate advanced technologies and devise avant-garde cartoning machinery to deliver maximum efficiency. Prominent participants in the cartoning machines market include Molins Langen, IMA Industria Macchine Automatiche SpA, Robert Bosch GmbH, Omori Machinery Co. Ltd. Tetra Pak International S.A., Marchesini Group, OPTIMA Packaging Group GmbH, IWK Verpackungstechnik GmbH, ROVEMA GmbH, Shibuya Packaging System Corpoartion, Cama Group, Triangle Package Machinery Co., Douglas Machine Inc., ACG Pampac Machines Private Limited, Econocorp Inc., PMI Cartoning Inc., Pakona Engineers Pvt Ltd., Korber Medipak Sysems North America Inc., Bradman Lake Group Ltd., Jacob White Packaging Ltd., and ADCO Manufacturing. As per a report by Transparency Market Research, the global cartoning machines market will likely expand at a CAGR of 5.1% between 2017 and 2025 to attain a value of US$6.7 bn by 2025. The market was evaluated at US$4.3 bn in 2016. Based on machine type, end-load cartoning machine segment is likely to attract significant revenue as end-load cartons find extensive demand in food packaging sector due to better stacking capability than other carton types. Wrap-around cartoning machine segment, however, is likely to surpass in terms of growth rate as wrap-around cartons are aesthetically appealing and offer better sealing than other carton types. By orientation, horizontal cartoning machines currently dominate the market due to their affordability and higher flexibility in terms of accommodating carton sizes. The end-load cartons are particularly more compatible to packaged using cartoning machines with horizontal orientation. The high demand for end-load cartons account for the dominance of horizontal machines over vertical machines. 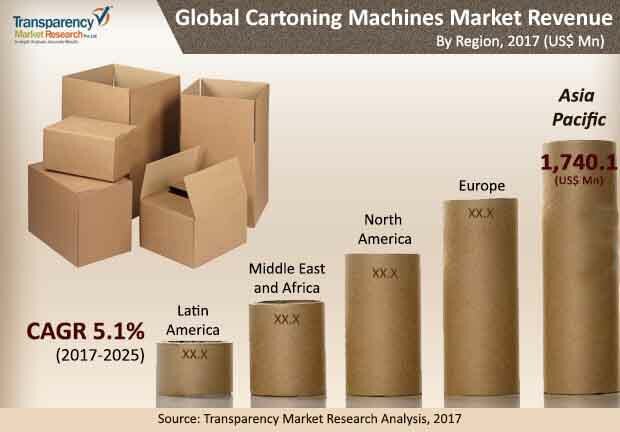 “The growth of the global cartoning machinery market is greatly influenced by evolution of the global packaging machinery market,” says a TMR analyst. Manufacturers of packaging machinery are involved in design improvements and to expand capacity, automation, and quick change over capabilities to strengthen their position in the intensely competitive packaging machinery market. Another key factor driving the cartoning machines market is changing consumer preference and demand for innovative packaging solutions. This is compelling packaging machinery manufacturers to devise machinery that can handle huge volume with minimal human interference. Nevertheless, the adoption of innovative packaging solutions is largely dependent on speed of packaging with minimum errors and the one that involves minimum wastage of raw material. The burgeoning healthcare industry in several parts of the world is also positively impacting the global cartoning machines market. The demand for a range of packaging solutions to transport and store clinical products is providing opportunities to cartoning machine manufacturers to develop specialized machines. However, the food industry is currently the leading end-use industry for cartoning machines market.